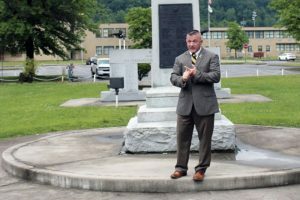 LOGAN, W.Va. — State Sen. Richard Ojeda will host educators for education advisory meetings throughout the Third Congressional District in the upcoming weeks. Sen. Richard Ojeda announced May 12, 2017 that he will run for the open United States House of Representatives seat in 2018. Ojeda ran for the same seat back in 2012, but lost to incumbent Nick Rahall in the primary election. A total of five meetings will take place, where teachers and other educators are invited to express their concerns about education and the policies that affect them and their classrooms. Ojeda, who has announced his candidacy for the Third District congressional seat in the 2018 election, said he also will ask educators about changes they want to see made and how government can best serve them and their students. The Democrat from Holden, West Virginia was elected to the state Senate District 7 seat in 2016, representing Boone, Lincoln, Logan counties and parts of Mingo and Wayne. Ojeda said these advisory meetings will be taken into account when crafting his full education policy. Ojeda said he’s hopeful that many area teachers will come out and voice their concerns. He said after working in the Logan County school system for four years, he has seen some of the ways teachers in West Virginia have lost out compared to educators in other states. — Logan, Mingo, Boone and Wyoming County teachers will meet at 1 p.m. Sept. 16 at the Logan Area Public Library. — Raleigh, Mercer, Summers, Nicholas and Fayette County teachers will meet at 9 a.m. Sept. 23 at the Raleigh County Public Library. — Cabell, Lincoln and Wayne County teachers will meet at 9 a.m. Sept. 30 at Infinity Marketing Solutions in Huntington. — Greenbrier, Pocahontas, Monroe and Webster County teachers will meet at 1 p.m. Oct. 7 in Lewisburg City Council Chambers. — McDowell County teachers will meet at noon Oct. 14 at the Sterling Drive Inn. Current 3rd District U.S. Rep. Evan Jenkins, a Republican, announced earlier this year he would not be seeking re-election to order run for the U.S. Senate seat now held by Democrat Joe Manchin. Since then a number of candidates have expressed interest in the congressional seat, which represents Boone, Cabell, Fayette, Greenbrier, Lincoln, Logan, Mason, McDowell, Mercer, Mingo, Monroe, Nicholas, Pocahontas, Raleigh, Summers, Wayne, Webster and Wyoming counties. In addition to Ojeda on the Democratic side, Huntington Mayor Steve Williams, Tri-State Transit Authority CEO Paul Davis and Edwin Vanover of Bluefield have announced their candidacy or pre-filed for the seat. Republicans who have expressed interest include state Delegate Carol Miller of Cabell County, state Delegate Rupie Phillip, of Logan County, Rick Snuffer of Raleigh County and Dr. Ayne Amjad of Raleigh County.